Attention, car and RV drivers. Your days of fearing the tight-spot reverse situation are finally over. 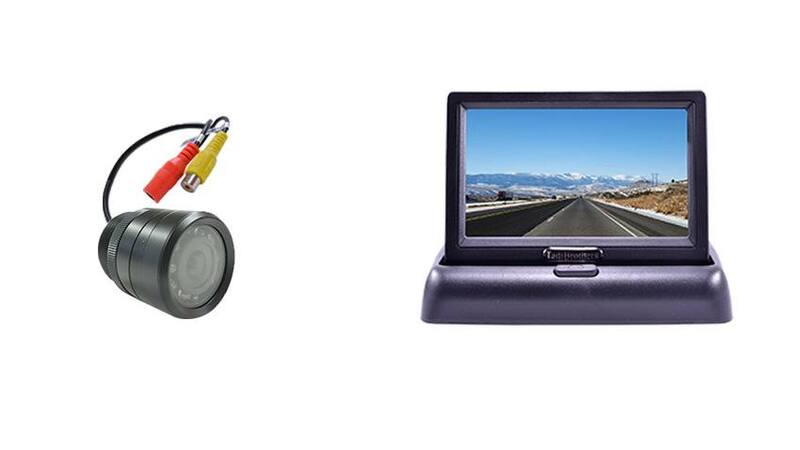 Introducing our state-of-the-art backup camera system. This 3.6 inch pop up monitor with 120 degree bumper backup camera system has everything you need to master the art of reversing your vehicle with ease. Wireless technology links the bumper-mounted camera to your popup monitor, creating a crystal clear image of what’s behind you, no matter what the situation. Our backup systems are high quality, meaning the technology you’re investing in won’t let you down. Trust us: we understand how important visibility is when it comes to reversing a car or RV. The Bumper camera is mounted by embedding it inside the bumper for a clean and secure look. The camera has a 120° angle which is best for Cars, SUVs, Trucks, and RVs. With 120° everything behind the vehicle can easily be seen due to the high degree of angle. This camera works great for RVs and wider vehicles too. It is also color, waterproof and has military grade night vision. The camera is also durable for use in the roughest weather conditions. Different brackets are included for installation so it can be angled downwards or upwards if necessary for an ideal view. Specifically with the camera that comes with this system, you’ll be equipped with 120 degrees of visibility behind you, which when paired with a high-quality image will give you the display you need to safely and confidently maneuver in reverse. Plus, the accompanying pop-up camera is there when you need it and folds down when you don’t. In addition to this model of backup system, we also offer a variety of other backup camera systems for RVs, cars and 5th wheel tow-behinds. If you have a vehicle that you want to install a backup camera on, we have the technology to make it happen. Join the growing number of people who no longer fear the tight space backup. Get your 3.6 inch pop up monitor with 120 degree bumper backup camera today.